Navigator North are Vicky Holbrough, James Lowther, and Nicola Parkin, they formed in 2010 with a common desire to support artists, use unused spaces and initiate public facing works of art. Work and Play is the first programme that connects these three strands, and explores what work and play mean to us today. The theme of this programme was inspired by the history of the site of Dundas House. The building that once stood on the site, Middlesbrough Winter Gardens, was designed to provide a place of leisure for “the worker, his wife and friends”. It was at the time described as “one of the most hopeful social experiments now being tried in England”. At Dundas House we climb the flights of stairs through a corporate building. We are led out onto the roof. The view of Middlesbrough is expansive. The hills are in the distance but they are cut through with a swath of industry. It then becomes clear how important leisure time must have been. From a similar ideological stance the factory at Lingfield Point in Darlington was built in the 1950s. It was built as the Paton & Baldwin yarn factory, there were many social events, dances, carnivals, plays, sports days, tennis courts; formal gardens, even allotments were part of the factory grounds. The site even boasted its own train and generated its own electricity. This great experiment had very positive outcomes;former workers remember the family atmosphere. Unfortunately due to the trend away from home knitting in the 1970s the factory closed down. The site is currently undergoing regeneration and hosted the successful Festival of Thrift in September 2013. James Paterson was artist in residence at the site. One of the first surfaces that Paterson drew on, as a boy, were off-cuts of card that his Grandmother brought home from the factory. This familial connection was one of the motivating factors in the devising of the residency. Paterson’s successful practice is generally commission based, leaving little time to experiment or play. The residency, says Paterson, has invigorated his work. When the necessity to make a finished piece was removed from the process, the nature of the work changed completely. His ‘finished’ piece is like a giant sketchbook, an open narrative. The canvas suggests the feeling of a working factory. The image is predominately monotone, with the slightly blurred qualities of old photographs. It also features the colours of cine film, saturated reds and blues. The lines that run across the piece evoke a sense of wool running through machinery. As Paterson says “it is like a diagram of the factory”. In previous work he made use of advertising imagery, in the future he will be able to add much more of a sense of the worker, the people behind the products. 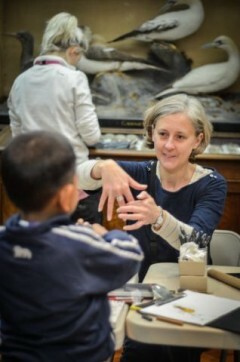 As part of Work and Play, Sara Cooper proposed a short residency at the Dorman Museum, specifically working with the Thomas Hudson Nelson Collection, a Victorian collection of eggs and nests. The circumstances leading to her proposal were a patchwork of coincidences, including finding some plates of eggs from a book from the period and familial connections with the coast. Cooper has used her residency to examine the practice of drawing in all its forms, using drawing in its widest sense, from mark making with pencil and paint to the use of carbon paper and printmaking techniques to capture the frozen yet ephemeral nature of the nests and eggs. Being in the gallery drawing has encouraged members of the public to come and speak to her and share their recollections about the Museum and memories of childhood activities. It has created space in which both she and visitors can both engage. The theme of the project is also borne out in the labour of the birds. It has launched many ideas for the future, from using digital technologies to record the building of nests, to the possible development of a series of commercial paints that emulate the blues, greys and green of the eggs. 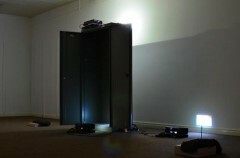 In two locations, Dundas Arcade and Dundas House, Callum Whitley staged an installation, “The general public’s unfamiliarity with human anatomy and physiology”. It is staged as if they were part of the detritus that had been left behind. There are four small monitors, whose imagery flickers in my peripheral vision. It is obscured so that nothing can actually be perceived, but there is the feeling that it can almost be recognised. This is in stark contrast to Paterson’s piece that was an almost legible narrative, which was very much about place and remembrance. This piece is very much about a moment and the present. After the show, this piece will no longer exist. But for now it is the here and now, frozen in time. The dynamics of imagery and object beguile the viewer. One solitary fluorescent strip light mirrors the flickering and intensifies the sense of emptiness. In the studio space the second part of the installation consists of an enigmatic assemblage of clay and a television screen, technologies juxtaposed. Studio Holder at Dundas House, Sophie McIntosh has also developed a Print Facility; her work explored the theme of Overwork. She has encouraged artists to print and overprint on each other’s work, playing with the idea of sole author and exclusivity of product. Also at Dundas House, Roberto Picciau and Scott Marks have subsidised studio spaces as part of the project. They are grappling with the issues that define practice after university, art practice in the larger context of the world of work, as versus the world of pedagogy. 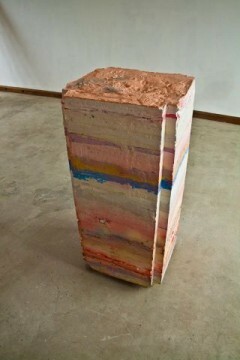 Picciau’s piece Alter Set Column is cast from Plaster of Paris with pigment introduced in layers. However it is not static, as Picciau has discovered that the pigment moves in the piece and responds to atmospheric conditions. The piece is monolithic, but still of a very human scale. It is changing and even crumbling as time passes. The sculpture and the structure of its fabrication are displayed in tandem, the one piece generated from the other. Picciau had not considered that the apparatus of the construction could also be part of the work, but this is the benefit of the shared studio space, discourse allows ideas to be explored from different perspectives. The wooden supports allude to the work; their bands of faded colour mirror the layers of the plaster piece, referring back to process and the theme of Work and Play. 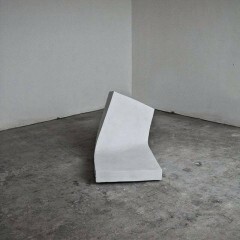 Marks’ piece, Untitled is an almost-optical-illusion, a found piece of foam has been soaked in plaster, then filled very skilfully with car body filler, so that the surface is practically smooth. It has become everything that foam is not, and even the soft, textural surface of the foam has been smoothed to a flat, hard solid. Marks refers to this as modern day craft. In his process he uses this, in combination with a twist of incongruity, or satire as he describes it, to produce works that are constructed impossibility. Gravity has caused the foam to slump, but this moment is now frozen in time; this piece is an articulation of process, subtly playing with the theme. As I sit on the train on my way home, I reflect that the themes of work and play, leisure and toil have defined this area. Navigator North have taken these themes and reframed them in the context of artist, space, production, and community. The various artists have all responded to the theme in their own way. The project has created a space for experimentation and thought. It has also allowed the public to have an insight into that process. So much art making is done away from the public sphere; it is projects like Work and Play that create a safe place for the artist to create and show work and for the public to view it. These are the spaces that create understanding. 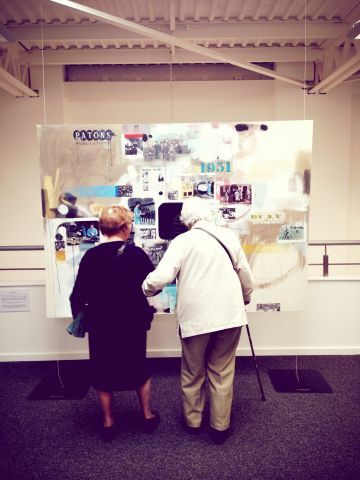 The project was funded by the Arts Council and East Street Arts. These are just three events that have been part of Work and Play further events have included arts training events, cross-crits in the studio spaces and a one-day experiment in promoting via social media. Scott Marks will be showing his finished pieces 8th February – 1st March 2014 at the Gilkes Street Gallery, Middlesbrough.